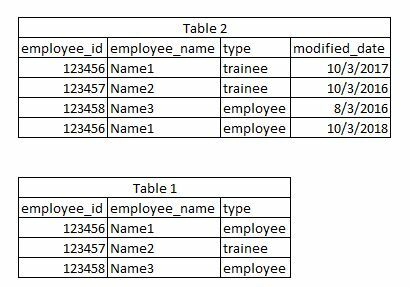 I wanted to update table1 based on table2 which has a common field employee_ID. I always have unique employee_ID in table1 but in table2 it may contain duplicate records with same employee_ID. I got another column in table2 where the modified_date is inserted. I want to update the table1 employee name with the table2 employee name based on employee_id and recent modified date. I got multiple columns to update with the same type of condition. any idea, here is so far i tried.